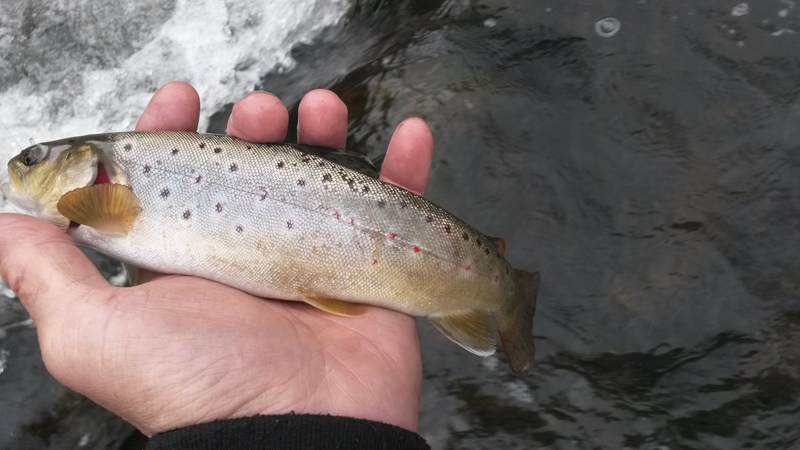 All about trout fishing in the great Garden State! I recognize that run in the third pic. Good spot for smallmouth too. That is exactly what I was thinking of doing this year. How was the trip via kayak? Any issues? Where did you put in and take out at? I launched under Rt31 bridge in Clinton. I took out before the headgates dam Bridgewater. Very nice paddle in between. Soooo many spots in between to fish without other fisherman in sight. That sounds great, I'll be doing that paddle this year. Plenty of great water well below the KLG and Clinton. I don't for the life of me understand the hard one people have for KLG. It's pretty but not remote, its most often crowded, the fish are pounded into submission. There's more than a handful of jerks whether they are sporting fly tackle or spin gear that make it less than enjoyable for the others whether they are sporting fly tackle or spin gear. As stated there is plenty of under fished good water not named KLG. KLG just gives the disgruntled something to complain about. It's one of the most scenic river (not smaller stream) areas in the state. That along with so much big pocket water is the draw. The overhead shade and the once stately hemlocks that remain add to the ambience. Agreed that it is over-hyped and over-fished, but it is worthy of some effort just for the scenery IMO. Pm if your interested in paddling it together. Company is always welcome on the river. Speaking of the Raritan and kayaks, I have been thinking about launching from Donaldson Park in Highland Park and kayaking (or, yakking, perhaps? It is the latter half of the Raritan after all ) down to Perth Amboy where the river enters the Bay. Anyone ever do this section of it? NOW is the time to drive around, do your scouting, look into permits for launching etc. You can launch at Boyd Park, Donaldson Park, Edison Boat Basin launch and Sayerville. Don't forget about the South River also. We catch these in Bound Brook in the spring on the Raritan river. Help me out here..The Rte. 31 bridge in Clinton is above the Clinton falls? By that new Hotel, or did you launch under the rte 78 Bridge, or the old rte. 22 bridge below the falls? Yes, that is ole Rte. 22..I grew up about 8 houses up the road...I could wade that part of the river blindfolded. Boy, you're a homebody aren't you? The last fish I almost killed, I took two bluegills out of the canal many years ago. Walked the fifteen minutes to the car, drove ten minutes home and put them in a bucket filled with water while I took a shower. Fifteen minutes later I went out to clean and gut them, they were swimming around in the bucket! I felt so guilty that I drove back to the same place I caught them and let them go. I never purposely killed a fish since, That was almost forty years ago.